Atrium Health goes beyond its medical and office walls to improve the health of communities through socially responsible programs, charitable giving and employee volunteerism. The health care system’s passion for giving back through community service starts with employees from day one. 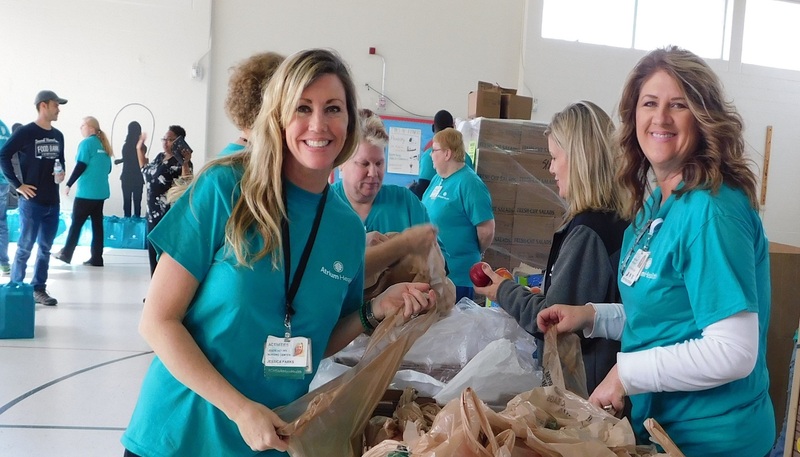 In Charlotte, new hires spend an afternoon as Second Harvest Food Bank volunteers, filling backpacks with healthy food items for hungry children in the community. This volunteer work engages employees, encourages team building and forges bonds across the company’s departments. 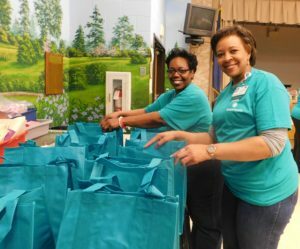 Employees continue volunteerism throughout the year with a variety of community service opportunities, including those coordinated by United Way of Central Carolinas’ Hands On Charlotte team. 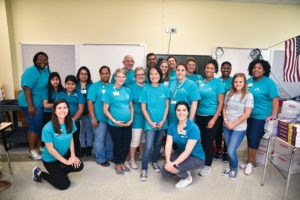 Hands On Charlotte recently helped coordinate community service projects for Atrium Health’s Facilities Management Group’s Summer Week of Service. 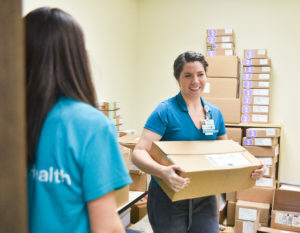 More than 130 volunteers served nearly 400 volunteer hours during July 16-20 – helping sort and inspect food at Second Harvest, organize medications at NC MedAssist and complete facility tasks at the Humane Society of Charlotte, among other projects at sites around Charlotte. Employees offered their time on July 16 at Ronald McDonald House of Charlotte to prepare breakfast for families. And others got involved on July 18 with volunteer opportunities at Crisis Assistance Ministry. On August 17 and 18, employees also assisted with projects at area schools during the inaugural Live United Day: All In For The Kids volunteer initiative led by Hands On Charlotte, the Charlotte Chamber and Charlotte-Mecklenburg Schools. Every fall, Atrium Health holds a campaign for employee giving. As one of the area’s largest funders of United Way, the company hosts kickoff breakfasts, agency fairs and contests to engage team members in the campaign. Additionally, Atrium Health sponsors Season of Caring events in each of the five counties included in United Way’s footprint, helping to recruit more than 1,000 volunteers for local acts of service. Atrium Health also is a funder and lead partner of Tutor Charlotte, a joint initiative of United Way, Read Charlotte, Charlotte-Mecklenburg Schools and others to provide high-quality reading and math tutoring for children. During the 2017-18 school year, the health care system adopted a first-grade classroom at Renaissance West STEAM Academy in the Renaissance neighborhood, one of United Way’s United Neighborhoods communities. At the school, 20 Atrium Health employees volunteered to read one-on-one with students for at least 30 minutes every week. For the 2018-19 school year, Atrium Health will sponsor additional volunteers and provide funding for Tutor Charlotte supplies in all kindergarten classrooms at Renaissance West STEAM Academy. Thanks to Atrium Health for continuously helping employees be more engaged in the communities around them.